More Rug Size Options Available! 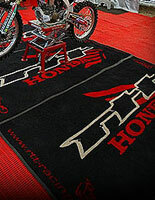 Place Custom Printed Door Mats at Your Place of Business Today! Personalize your entrance, lobby or office with a custom printed door mat that impresses the foot traffic moving about the floor. Why would one choose a custom door mat over a single-colored or factory design? A personalized logo, message or other branding tool is one of the best ways to greet clients or customers as they enter the building. After all, many people choose to look towards the floor as they stroll. Nobody forgets a bold, colorful logo embedded into the floor as they enter and exit the building, and very quickly begin to associate the building or office suite with the design. An otherwise plain lobby can very easily be improved with the addition of a memorable custom floor mat that accompanies the surrounding interior design. Who uses these mats? Most people remember walking into their high school to be greeted by an emblem of their school mascot and colors. 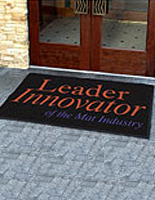 Many others have walked into a car dealership and noticed the large custom entrance mat with the make's logo established in the material. What makes these custom rugs so special? Their 100% nylon covering and rubber backing is forcefully bonded for reinforced durability that will stand up to the millions of footsteps it sustains, even in climates where galoshes may be the footwear of choice. Their huge sizes, including one product that is 3 by 10 feet, will cover the entire entrance, leaving your floor untouched and unscuffed by passersby, while protecting against potentially costly slips and tumbles. The custom mat is washable, and can be steam cleaned for minimization of chemical usage and residue left behind. The palette of fade-resistant colors on both the custom printing and the background, will embellish the entryway without detracting from lobby artwork and wall hangings. Choose from more than two hundred colors for the custom printing, and 25 colors for the background for a highly customized door mat that is only limited by your imagination. The artwork instructions are simple to follow and will guide you through creating your customizable text or graphics. Large corporations, make sure to purchase in large quantities for a low per-unit price. 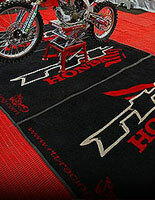 Shop custom printed door mats today and don't forget to visit our entire commercial floor mat catalog!